Two twentieth century violin concertos, stylistically polar opposites, but with a common emphasis on melody. Written by two very different composers who nevertheless, each in his own time, rejected the mid-20th century ascendancy of atonality and the serial composition of music. As if in reaction to having pushed melody aside for so long, the Violin Concerto, composed in 1993, is relentlessly, unforgivingly, melodic. Adams has called it “hypermelodic.” The entire piece is essentially one prolonged, continuously unfolding melody for the solo violin. Not that repetition as a device has disappeared from his music – the first movement sets the solo violin’s endless melody over persistent, steadily rising eighth-note figures in the orchestra. The second movement pays homage to a time-honoured repetitive form, one which moreover holds a cherished position in the violinist’s repertoire: the chaconne. Adams evokes a second duality here, beyond that of orchestra / solo instrument, with the association of a poem by American Robert Haas, “Body Through Which the Dream Flows.” The movement’s ethereal beauty is difficult to account for, but it is easy to imagine the solo violin’s fleeting, other-worldly imagery flowing through the sublime, yet corporeal sounds of the orchestra. 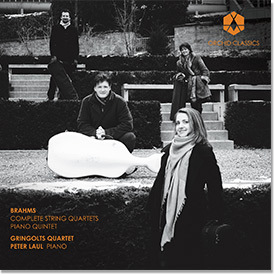 The third movement is a satisfyingly virtuosic romp, with thrillingly “minimalist” writing for the orchestra, all the while maintaining unrelenting melodic invention in the solo violin part. Erich Korngold’s Violin Concerto, premiered in 1947, might also be called “hypermelodic.” Korngold (1897-1957) himself noted that the concerto, “with its many melodic and lyric episodes was contemplated rather for a Caruso of the violin than for a Paganini.” Written at a time in music history where atonality held nearly undisputed sway in musically sophisticated circles (Korngold’s music is emphatically tonal, if harmonically complex), the work was the first in what Korngold hoped would be his triumphant return to concert music, after a long and celebrated career as Hollywood’s preeminent film composer. The piece contains material in each of its three movements from several of Korngold’s film scores, the rights to which he had shrewdly secured for himself in his contracts with the film studios. Korngold in many ways single-handedly defined the genre of the film score, but in spite of his success he was plagued by the notion that he had sold his talents too cheaply – that a “true” composer wrote music for the concert hall and operatic stage. Korngold was well-established as an opera composer in Vienna when he came to Hollywood for the first time in 1934. He returned in 1938 to write the score for 1938’s ground-breaking Robin Hood, starring Errol Flynn. Hitler’s Anschluss in March of that year intervened, and Korngold elected to stay in California, vowing to support his family by writing music for films until Hitler was defeated. Korngold’s final Hollywood project, released in 1946, was oddly enough a film set in the world of classical music (Deception, starring Bette Davis and Claude Rains), and one in which the composer was allowed an unusual level of involvement in both story lines and dialogue. Korngold wrote an entirely new cello concerto for the film, which later became his Op.37. Interestingly, the film contains what might be read as a camouflaged self-portrait: one of the film’s three main characters is a celebrated composer, Hollenius, whose music is described by one of the other central characters in the film as combining “the rhythm of today with the melody of yesterday.” The “rhythm of today” could easily be a reference to Stravinsky, whom Korngold ardently admired, and who had also settled in Hollywood in the mid-1940s; the “melody of yesterday” can be interpreted as Korngold’s contempt for the followers of Schoenberg and his twelve-tone system. The Violin Concerto, Op.35, was given its first performance by none other than Jascha Heifetz in February 1947 at a concert in St. Louis. In spite of overwhelmingly positive reception, Korngold feared the “snobbish, atonal anger” of the New York press at a performance scheduled five weeks later, and hastened to do all he could to advance a positive spin on the work in New York circles, where he felt he had little credibility, and no representation. His fears were well-founded. The work was called both “a Hollywood concerto” and “more corn than gold” in the New York papers, and Korngold’s reputation suffered the consequences of these harsh assessments. In spite of this chilly reception, the Violin Concerto has proven to be his most popular work for the concert stage. Ilya Gringolts has performed with leading orchestras around the world, such as the St. Petersburg Philharmonic, Chicago Symphony, London Philharmonic, BBC Symphony, NHK Symphony, Bavarian Radio Symphony and Warsaw Philharmonic amongst others, and been invited to prestigious halls including the Berliner Philharmonie, Wigmore Hall and the Concertgebouw Amsterdam to name but a few. 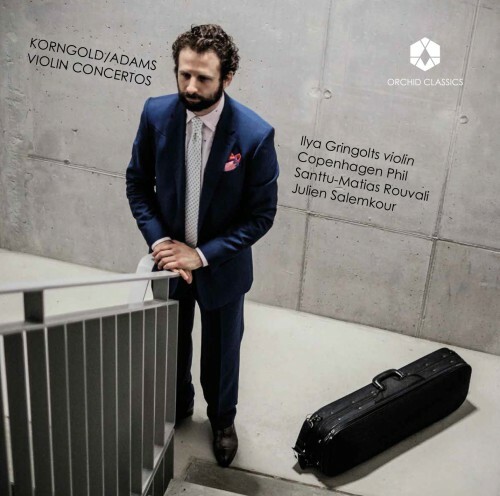 As a keen chamber musician Ilya Gringolts collaborates with artists such as Yuri Bashmet, David Kadouch, Itamar Golan, Peter Laul, Aleksandar Madzar, Nicolas Altstaedt, Andreas Ottensamer, Antoine Tamestit and Jörg Widmann. He is also the first violinist of the Gringolts Quartet, which he founded in 2008 and which enjoys great success with performances at the Salzburg Festival, Lucerne Festival, Menuhin Festival Gstaad and Teatro La Fenice in Venice among others. Finnish conductor Santtu-Matias Rouvali is one of the most exciting conductors of the younger generation. Already with an extremely established career in September 2012 Rouvali was announced as the next Chief Conductor and Artistic Director of the Tampere Philharmonic Orchestra and began this post, alongside his position as Principal Guest Conductor of the Copenhagen Philharmonic Orchestra, in September 2013. He is Chief Conductor of the Gothenburg Symphony Orchestra from the 2017/18 season. In Europe he regularly works with orchestras such as the Royal Stockholm Philharmonic Orchestra, Bamberger Symphoniker, Orchestre Philharmonique de Radio France, the Philharmonia Orchestra in London and the BBC Symphony Orchestra. Further afield, he has returned to the Tokyo Symphony Orchestra and toured in Japan, and conducts a number of prominent orchestras in North America including the Los Angeles Philharmonic. In opera, Rouvali has conducted Bizet’s Carmen and Mozart’s Die Zauberflöte with the West Coast Kokkola Opera and he looks forward to future projects with his own orchestra at Tampere Opera. Julien Salemkour has been Daniel Barenboim’s assistant conductor for 12 years, from 2000 to 2012. In 2011, he was awarded the title “Staatskapellmeister” for his contributions in service to the Berlin State Opera — an honour which had heretofore only been bestowed upon Sebastian Weigle, and Herbert von Karajan. A highlight in Salemkour’s career came in 2006, when he was called upon to step in for Daniel Barenboim, who was slated not only to conduct, but also as soloist in Mozart’s Piano Concerto No.23. Salemkour took over both roles on that evening. The concert, a gala event in celebration of Mozart’s 250th birthday, was broadcast live in 23 different countries. Julien Salemkour has also guest-conducted at the Metropolitan Opera in New York (Turandot), La Scala in Milan (Swan Lake), the Semperopera in Dresden (The Magic Flute, The Barber of Seville, and Rigoletto), and the Israel Symphony Orchestra (Salome), among others. He has stood on the podium for over 250 performances at the State Opera in Berlin. Copenhagen Phil, in the summer also known as Tivoli Copenhagen Phil, is based in Copenhagen, but as one of five nationally-supported Danish orchestras charged with bringing symphonic music to the entire country, is active all over the island of Zealand. The orchestra also tours internationally. Copenhagen Phil is dedicated to renewing and developing itself in order to play a significant role in its culture and to maintain relevance in society at large. An important aspect of the orchestra’s culture is that everything is accomplished internally by the musicians and administration together. The orchestra’s comprehensive work with children takes as its starting point that all sensory and experience-based learning creates an opportunity to cultivate a relationship to art and culture, and that this opportunity renews itself again and again. Copenhagen Phil has developed new concert formats, including the indie-classical series “60 Minutes,” unique concerts where the orchestra works with artists across genres. The orchestra has also set a focus on establishing and cultivating a meaningful presence in the digital world, being among the first orchestras in the world to conduct successful “flash mobs,” which later became viral videos on YouTube. This success is being followed up by a large-scale digital project entitled “Open Orchestra”, where internet users all over the world can embark on a journey of musical discovery behind both the music and the orchestra’s musicians. The foundation under Copenhagen Phil’s activities is the performance of classical music on the highest level. An example of this ambition made manifest is the orchestra’s recent recordings of the complete Beethoven symphonies. But all of the orchestra’s activities start with the musicians’ own dreams and the wealth of their own ideas. In this way, tradition and renewal equal far more than the sum of their component parts.